Remove the hard drive cage. See Remove the Hard Drive Cage. Remove the No. 1 Phillips screws securing the front control panel light pipe assembly to the hard drive cage. Two screws secure the assembly to the hard drive cage in the Sun SPARC Enterprise T5120 server. Three screws secure the assembly to the hard drive cage in the Sun SPARC Enterprise T5220 server. 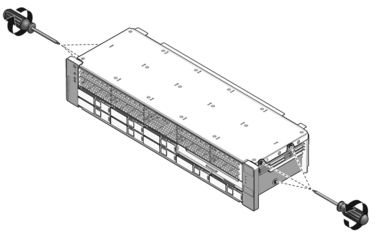 The following figure illustrates installation of the front control panel light pipe on a Sun SPARC Enterprise T5220 server. Except for minor differences, such as the number of screws, installation is the same for Sun SPARC Enterprise T5120 servers. Slide the light pipe assembly out of the control panel.